Personalise your home décor Chic design Great focal point on your wall Protective glass front Ideal in your bedroom, dining room or living area 3 Rectangular 4 x 6" 2 Rectangular 5 x 7" 1 Square 4 x 4" . 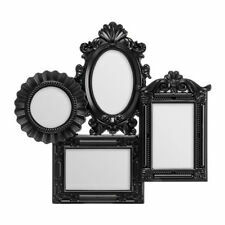 Personalise your home décor Space saver Elegantly designed frame Seven frames, 1 x portrait, 2 x landscape, 2 x round, 1 x oval and 1 x square Embossed decorative detail 1 Oval 5 x 7" 3 Rectangular 4 x 6" 2 Round 5" 1 Square 4 x 4" . 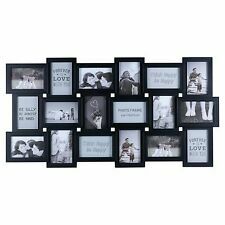 Multi Photo Frame, 4 Photo/Cream Plastic Frame, 4 x 6"
Main Colour: Cream. Excellent Support. We aim to resolve or answer your query as soon as possible. 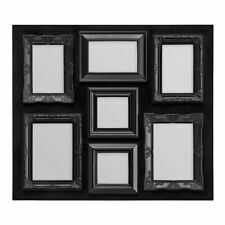 Multi Photo Frame, 4 Photo/Black Plastic Frame, 4 x 6"
Main Colour: Black. Excellent Support. We aim to resolve or answer your query as soon as possible. 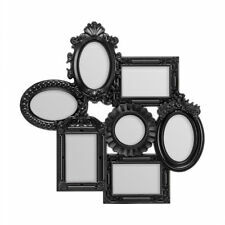 Multi Photo Frame, 4 Photo/White Plastic Frame, 4 x 6"
Personalise your home décor Space saver Elegantly designed frame Seven frames, 1 x portrait, 2 x landscape, 3 x oval and 1 x round Embossed decorative detail Dimensions (W x D x H): 55 x 3 x 55cm . Personalise your home décor Elegant design Great focal point on your wall Protective glass front Ideal in your bedroom, dining room or living area Dimensions (W x D x H): 43 x 3 x 40cm . They hold up to 10 6" x 6" photos. They feature front-loading convenience to make inserting art work quick and easy. They are made of durable plastic and allow for vertical or horizontal display. Snap-on easel or wall mount. We will work with you to resolve any problem you may have. Black styrene front. Set up either horizontally or vertically. Each one is made with a durable and easy-to-clean plastic edge with a glass front so you can keep them looking nice. They will look good hung on a wall or you can attach the snap-on easel to display them on a table, dresser, counter top or other flat surface. 8" x 16" photo collage matted to hold three 4" x 6" photos. Plastic construction with satin black finish. Designer Henrik Preutz / IKEA of Sweden. We are confident you will love our array of New, Open Box, Gently Used and Rescued Toyz. You can easily change pictures by sliding up the front panel and inserting the picture. It can be mounted either vertically or horizontally to achieve the desired effect. The plastic extruded construction is durable and long lasting. You will need a suitable adapter to use the item in your country. Each elegant piece lets you preserve your family milestones, artwork, awards, certifications and more. Position them vertically or horizontally, depending on the layout of your image. The pieces are lightweight, making them easy to hang. 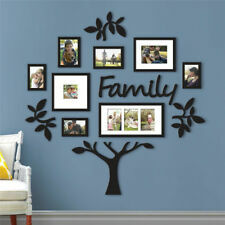 Creates a personalized focal point with photo collages and letters. Word plaque that reads "gather". Makes an impressive display on your wall. Featuring an unadorned slim profile, it works with classic and modern. It is made of durable plastic with a sturdy styrene front. 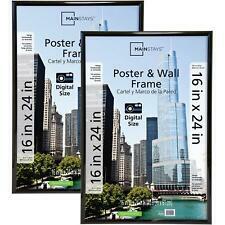 It's ideal for large prints displayed in hallways, big break rooms and conference rooms. The glass also polishes easily. Plexiglass insert. Featuring an unadorned slim profile, they work well with either a classic or modern decor. They have a style of prominent simplicity, making them suitable for a variety of pictures and artwork. Their four individual rails attach independently, so you can easily and neatly insert the intended item.